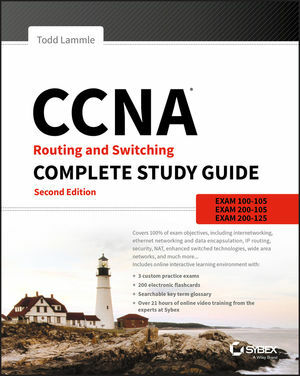 CCNA Routing and Switching Complete Study Guide, 2nd Edition is your comprehensive review for the CCNA exams. Written by the leading authority on networking technology, this guide covers 100% of all objectives for the latest ICND1, ICND2, and CCNA Composite exams. Hands-on labs help you gain experience in critical procedures and practices, and the network simulator provides a realistic lab environment so you can practice at your own pace. Gain access to the Sybex online learning environment, featuring a robust set of study tools including: practice questions, flashcards, video instruction, and an extensive glossary of terms to help you better prepare for exam day. The pre-assessment test helps you prioritize your study time, and bonus practice exams allow you to test your understanding. A. Host A cannot communicate with the router. A. Host A can communicate with the router. In the ?Bit? column, row that displays ?8? Answer: C. A CIDR address of /19 is 255.255.224.0. This is a Class B address, so that is only 3 subnet bits, but it provides 13 host bits, or 8 subnets, each with 8,190 hosts.